April Showers Bring May Flowers...and sometimes more! Many are surprised to learn that flooding is the largest natural disaster in the United States. And historically, Texas usually ranks in the top five states with the largest amount of storm and flood claims reported. The record rainfall in Lubbock is 40.55 inches. For some reference, visualize a 36-inch yard stick, plus some. 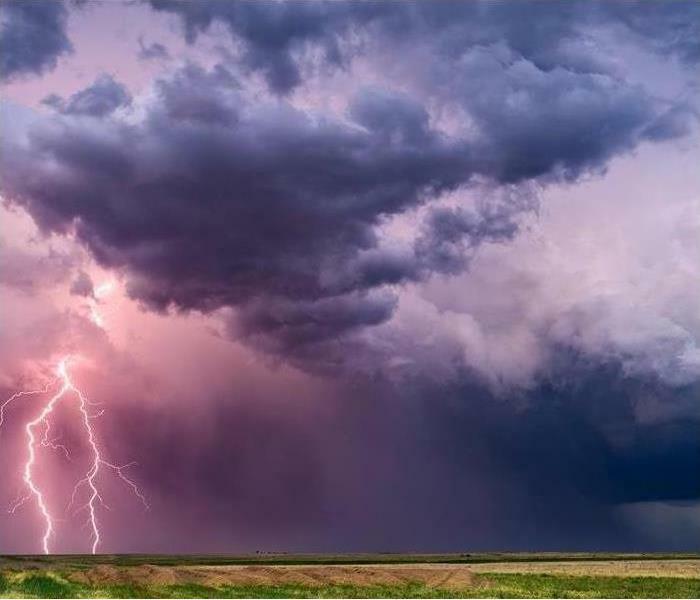 Protect your property and personal belongings from storms with SERVPRO of Southwest Lubbock’s highly trained professionals, who use specialized equipment and advanced training to restore your property. We understand that when dealing with water damage, time is of the essence. That’s why you can contact us 24 hours a day and depend on our immediate response. We understand what a stressful situation the threat of flood damage in the home is and care about restoring your property to its pre-storm condition. That’s why we suggest taking at a look of these helpful tips on what NOT to do immediately after you experience a flood in your home. When dealing with water damage, every second counts, call SERVPRO of Southwest Lubbock at (806)-780-6311 to request immediate recovery following a disaster. 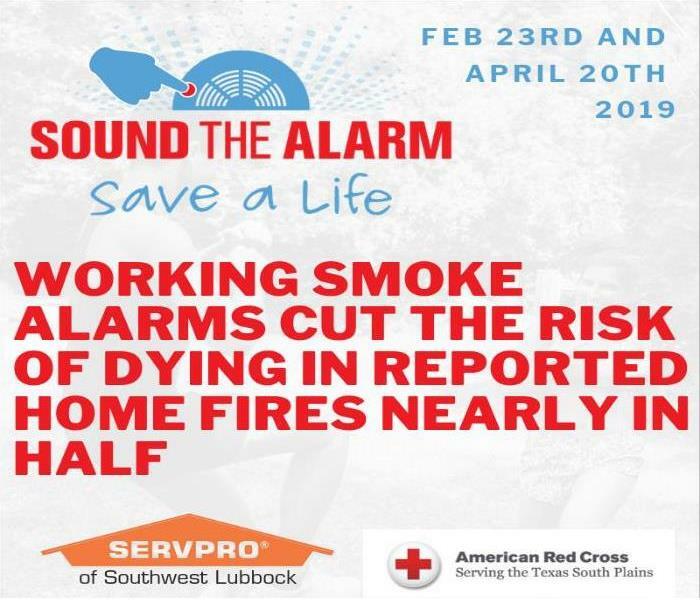 SERVPRO® will be teamed up with the American Red Cross for Sound the Alarm, Save a Life event on February 23 installing smoke detectors in homes for free, and will continue to do so on April 20th. We’re taking notes from 9-year-old Hector Montoya from Dallas, who after learning of a local deadly fire that could have been prevented with a smoke alarm, donated the 300 dollars he had saved up from a new PlayStation to buy new smoke alarms for his community. Each year, the Red Cross responds to nearly 70,000 disasters — the majority of which are home fires. Whether a disaster impacts a single family or hundreds, the Red Cross is there when people need our help the most. The Red Cross doesn’t just help families recover from disaster; they also prepare communities before home fires strike. Sound the Alarm is a nationwide Red Cross effort to help reduce the number of deaths and injuries from home fires. SERVPRO offers access to expertly trained technicians with years of experience performing fire damage restoration for customers just like you. We have IICRC certification, industrial-grade equipment, and 24-hour emergency services available throughout the area. 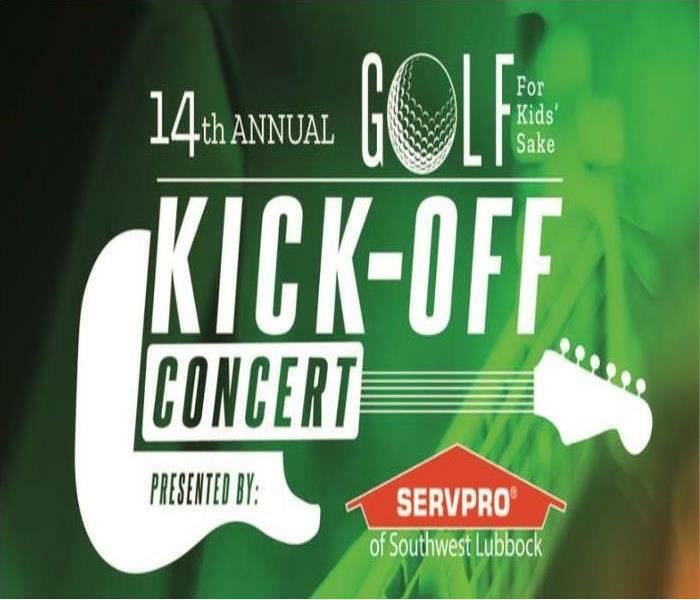 SERVPRO® of Southwest Lubbock is pleased to present a kickoff concert and the 14th annual Golf for Kids' Sake Golf Tournament benefiting Big Brothers Big Sisters® of Lubbock. The Kick-Off Concert will feature The Mike Pritchard Juke Box Band with Ken Matlock, Dustin Garrett and Bobby McDowell on Friday, April 26, 2019. This event will also include a barbecue dinner, silent auction and door prizes. 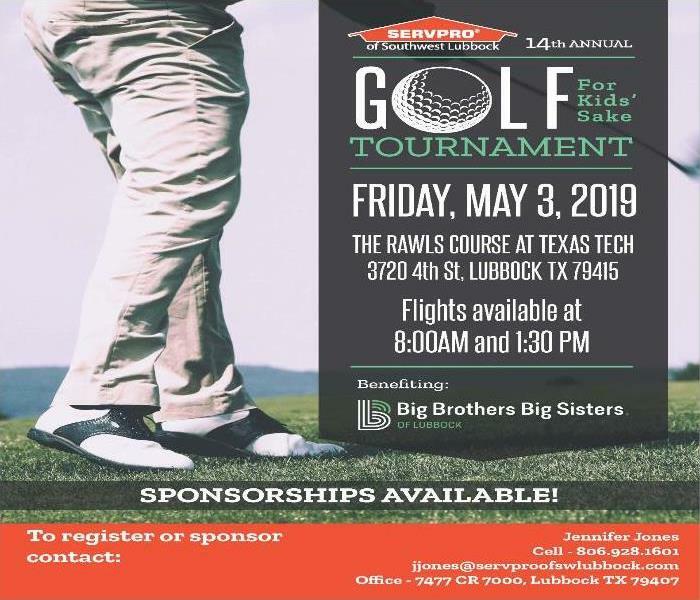 This event is the largest annual fundraiser for Big Brothers Big Sisters® of Lubbock, hosted by SERVPRO, with all proceeds going to their benefit. Big Brothers Big Sisters has been the leader in one-to-one mentoring nationwide. As the nation’s largest donor and volunteer supported mentoring network, Big Brothers Big Sisters prides itself in creating one-to-one mentoring opportunities for children between the ages of six and fifteen. Through continuous partnerships with local school districts, community service organizations, and various businesses, Big Brothers Big Sisters is able to serve children with meaningful and life-changing professionally supported one-to-one mentoring services. SERVPRO of Southwest Lubbock was honored and blessed to once again join forces with Big Brothers Big Sisters of Lubbock to help raise money for their organization. SERVPRO is dedicated to being a leader in the community in everything they do including the multiple restoration services they provide. As a trusted leader in the restoration industry, SERVPRO® of Southwest Lubbock provides 24-hour residential and commercial services. As a locally owned and operated business, they’re dedicated to being faster to any size disaster, with the experience, training, equipment, and expertise to handle restoration and cleaning needs. In additional to restoration, they offer a variety of cleaning services from furniture and carpets to severe mold, air ducts, and biohazard clean up. SERVPRO of Southwest Lubbock celebrates 10 year anniversary with ribbon cutting. 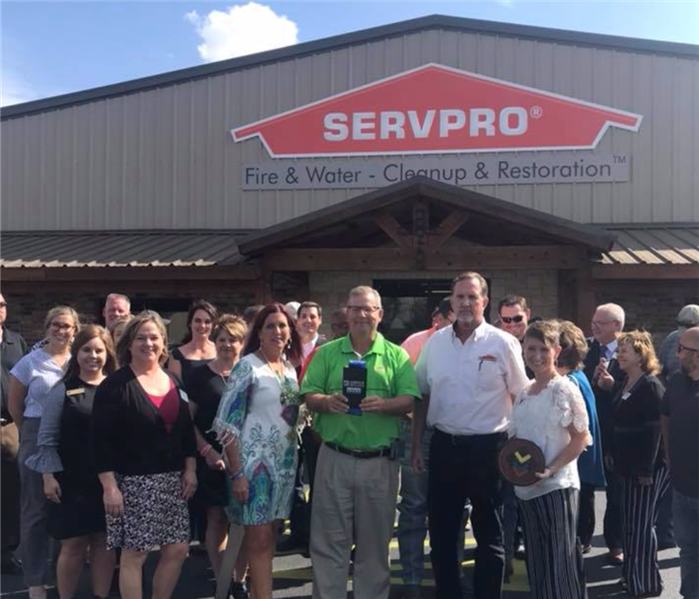 SERVPRO of Southwest Lubbock has been serving the Lubbock Community since 2008, and recently we celebrated our 10th anniversary back in September with a ribbon cutting and reception! Joel Mowery and David Miller purchased the franchise in 2008 and have independently owned and operated SERVPRO of Southwest Lubbock since. With no shortage of memorable milestones such as moving into our new building in 2016 and partnering with local non-profit organizations such as Big Brothers Big Sisters, Challenger Little League, American Red Cross and Coats For Kids with the Lubbock Professional Fire Fighters Association. 2018 marked an entire decade of dedication to exceptional service, providing timely relief in stressful cleanup and restoration situations for our customers. 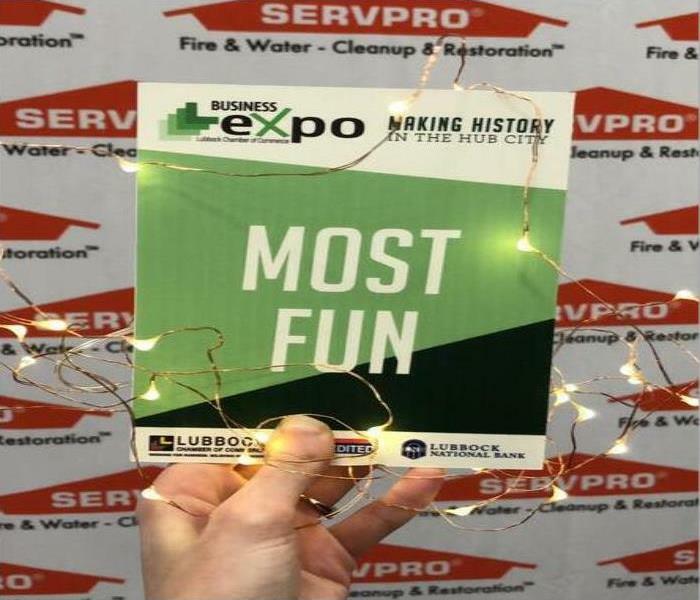 SERVPRO of Southwest Lubbock was awarded the "Most Fun" booth at the 2019 Business Expo. The Lubbock Chamber of Commerce held its annual Business Expo at the beginning of 2019. The 2019 Business Expo was a networking event, showcasing over 200 exhibitors with more than 5,000 attendees and has been a popular Lubbock happening for over two decades. In compliance with this year’s theme, “Making History in the Hub City”, SERVPRO of Southwest Lubbock put our booth attendees Lubbock history knowledge to the test through a game of Jeopardy. With categories about Lubbock History, SERVPRO, MDM Construction and Big Brothers Big Sisters, attendees were able to learn more information, showcase their game-show worthy skills, and most importantly- have fun while visiting our booth. In fact, attendees had so much fun that SERVPRO of Southwest Lubbock was awarded the Most Fun Booth title, as selected by the Lubbock Chamber of Commerce! It’s not too late to test your trivia skills! How much do you know about SERVPRO? Q: True or False: SERVPRO is a Trusted Leader in the restoration industry. Q: How many franchises does SERVPRO have across the country? Q: How many locations has SERVPRO had in Lubbock over the years? Q: How long has SERVPRO been in business in Lubbock? Q: What is the local philanthropy of SERVPRO? More than 16 million American children don't own a coat. That’s why for the last 6 years, the Lubbock Professional Fire Fighters have partnered with Operation Warm to provide kids in Lubbock with a warm coat. 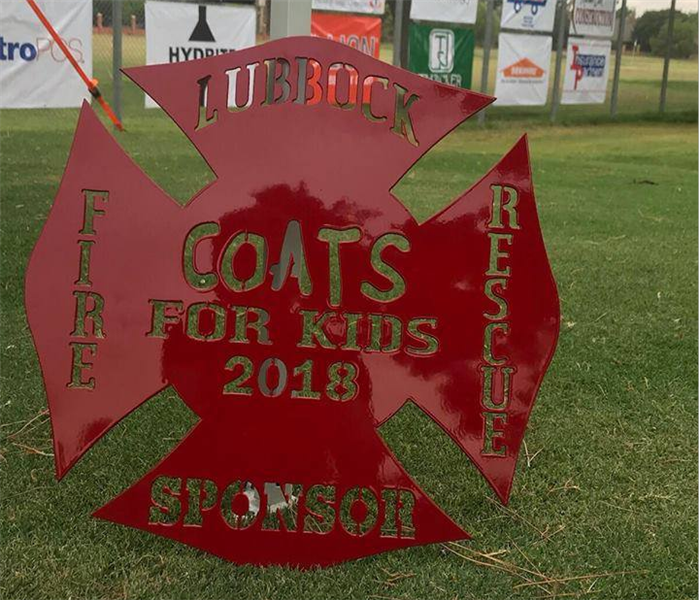 Last July, SERVPRO of Southwest Lubbock was a sponsor at the Lubbock Professional Firefighters Association’s Golf Tournament for Coats for Kids. Money raised through tournament founds went to the purchase of winter coats for the students of an LISD Elementary Campus. Giving a child a new coat positively impacts that child’s self-esteem and self-worth. The Coats for Kids Foundation believes—and school principals, nurses, and social workers agree—that the impact on kids that receive coats from CFK is dramatic, as evidenced by heads held high, smiles, and fewer missed days of school because of illness. Along with organizations such as Big Brothers Big Sisters, Challenger Little League, American Red Cross, Coats for Kids with the Lubbock Professional Fire Fighters Association is a valued philanthropic partner of SERVPRO of Southwest Lubbock. SERVPRO Of Southwest Lubbock will be hosting our 3rd annual For Kid’s Sake Kick-Off Concert Friday, April 26, 2019 from 5:30-11:00 PM hosted at SERVPRO of Southwest Lubbock, 7477 Country Road 7000, Lubbock, Texas. For Kid’s Sake Golf Tournament and Kick-Off Concert is the largest annual fundraiser for Big Brothers Big Sisters of Lubbock, with all proceeds going to their benefit. Big Brothers Big Sisters matches children with volunteers who can serve as role models, to build self-confidence, social skills and academic achievement for the children. If you have any additional questions, or are interested in sponsorship, be sure to contact Jennifer Jones at Jjones@SERVPROofswlubbock.com . As time springs forward, we all can relax and enjoy that extra hour of daylight we get in the evening. What we can’t relax about is the build-up of general wear and tear that commonly soils an office place from the year prior. Spring is the time to address the mess, and who is the best choice to help if not SERVPRO® of Southwest Lubbock? SERVPRO® of Southwest Lubbock is the premier provider of specialty cleaning services that include but are not limited to Air Ducts and HVAC, Carpet and Upholstery, Drapes and Blinds, Ceilings, Walls, Hard Floor cleanup, Odor Removal and Deodorization of commercial spaces. You’re busy, we get it! Don’t let time waste any longer. SERVPRO® of Southwest Lubbock is available 24/7 and can assess and clean any situation in no time, "Like it never even happened." Local to Lubbock, our response is quicker than ever, equipped with the right resources to assist in restoration and cleanup of any size disaster. We have the specialized training and products to get your property back to business. Why call those other carpet guys when SERVPRO® can do it all? When grime, odor, and moisture challenges go beyond the scope of your regular janitorial staff, you should call SERVPRO® of Southwest Lubbock for prompt service. Whether it’s removing an odor problem or deep cleaning flooring or carpets, you can rely on us to spring your workplace into shape. When was the last time you took a good hard look at the corners of your office? Can you see track marks down your hallway? How about the dust bunnies multiplying in your air vents? It’s time to call in SERVPRO of Southwest Lubbock. Lubbock had snow this winter, and even though snow looks clean, it pulls in all kinds of muck when stuck to your shoes. The wind that followed can do your office just as dirty, blowing in layers of grime between the smallest of cracks in your doorways and window panes. Best case scenario: it also blew in flower seeds and you get a lovely spring surprise, fertilized and watered by your office carpets. Worst case scenario: your new cubicle mate is splotchy spots, smells gunky, and is not great with customers. SERVPRO of Southwest Lubbock’s professional cleaning can address moderate and heavy soil conditions in your carpets. A good rule of thumb would be to call SERVPRO for a professional cleaning carpet every 12 months. For a cleaning backed by state-of-the-art equipment, over 40 years of experience and Professionals trained to the highest standards, call us today at (806) 780-6311. If your home suffers from a crime scene and has damage, contact SERVPRO of Southwest Lubbock to help with the clean up. Homeowners in Lubbock and West Texas rarely plan a response to criminal activity on their property. 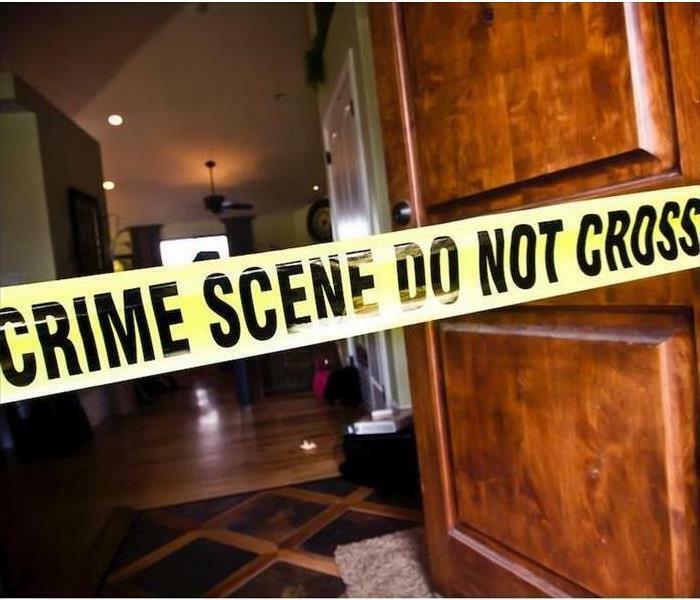 Coping with all the aspects of your home becoming a crime scene is an emotional process, exacerbated by the need to arrange for cleanup after the legal authorities release the property. Our technicians have the training, the equipment, and the appropriate products to smooth this challenging process out for you. The frightening or sad circumstances underlying the need for crime scene cleanup in Lubbock and West Texas are varied. A home invasion, the aftermath of a suicide, a domestic that turns deadly, activities like drug manufacture or dealing, and many other horrific scenarios can affect any of us given the stressors no one can predict. Innocent victims are left to sort out the debris and residues remaining, many of them hazardous and requiring professional handling. We specialize in an efficient and compassionate response to these life-altering events. SERVPRO technicians master techniques that meet the IICRC Standard for trauma and crime scene cleanup. We arrive prepared to assess and plan for the particular situation, ready to begin the remediation immediately. The crew members know and carry out all federal, state, and local requirements as they complete each task in the plan, essential for your and your family’s return to safe and comfortable living conditions. Blood, bloodborne pathogens, tissue, and fluids. Law enforcement and evidence collection residues including fire extinguisher residues, tear gas, pepper spray, and fingerprint dust. Chemical residues used in drug making, cutting, and distribution. The SERVPRO crew members then clean and disinfect the surfaces affected using EPA registered antimicrobials. All hazardous materials are bagged and disposed of according to the applicable laws for the appropriate jurisdiction. We assess the physical damage done to structural components, fixtures, and furnishings. SERVPRO can offer pack out services for portable items contaminated with residues, working on restoration at our production facility. SERVPRO consults with your insurance or governmental entities to arrange for the repairs and restoration needed to return your home back to its pre-crime condition. You are not alone in coping with the aftermath of criminal activity in your home when you work with the specialized cleanup crews from SERVPRO of Southwest Lubbock. Call (806) 780-6311 day or night to schedule a crime scene restoration consultation with one of our compassionate and competent project managers. 4/15/2019 - April Showers Bring May Flowers...and sometimes more! 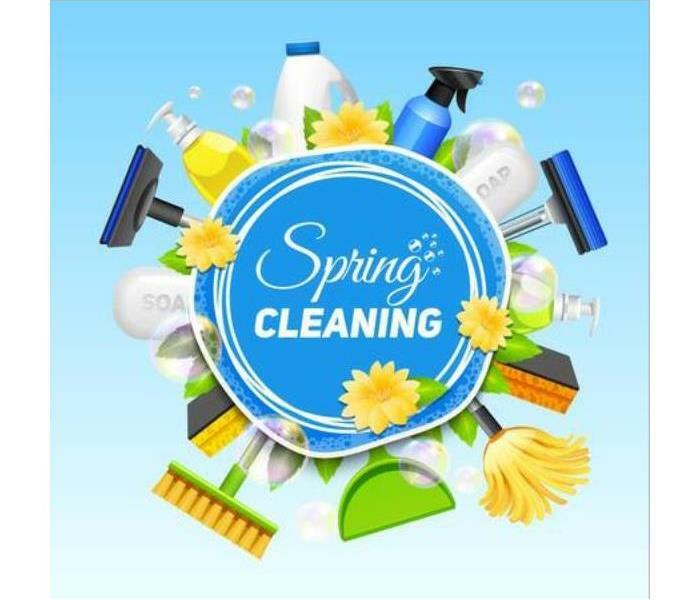 3/20/2019 - Spring Cleaning...are you ready? 3/18/2019 - Spring Cleaning? It's Time! !